David Loftus and Andy Simon Harris are the two good men behind the force that is Jamie Oliver. The former has taken photos for all but one of the Oliver’s internationally-bestselling cookbooks. The latter is editor of Jamie Magazine. Together, they are eager to share with us the food and culture that is their Marrakesh, a place they have known and enjoyed for many years. Part travelogue, this food journal and cookbook immerses us in the daily experience of living in Marrakesh. On our journey with the author and photographer through the city, we are led to appreciate the social importance and practicality of cooking in wood ovens and charcoal pits, many of which are shared amongst neighbours for slow-cooking the traditional conical tagines of meat and vegetables while catching up on conversation. Loftus presents the beauty of belly dancing and colourful dyed fabric, while Harris is careful to provide explanatory text to accompany images of local workers in leather-tanning baths, risking their health in the production of the hides which will appear later in the local souks so popular with tourists. 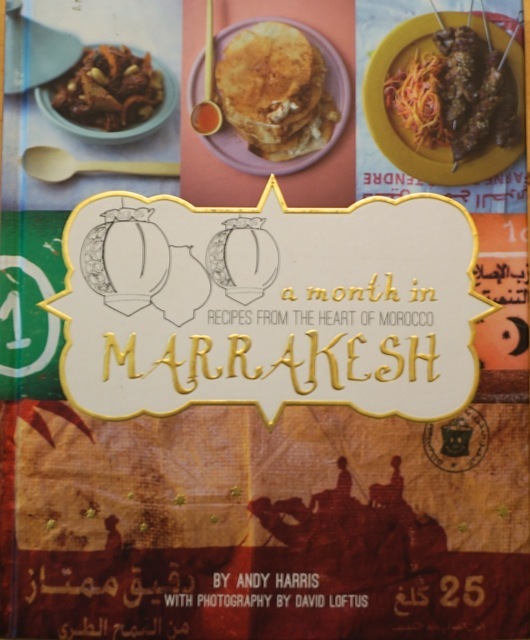 The aromas of cumin, paprika and turmeric seem to float from the market photographs, providing motivation for the reader to recreate the Moroccan food experience at home. Harris provides a lexicon of ingredients at the end of the book, accompanied by Loftus’ helpful encyclopedic photographic illustrations. Some, such as harissa, can be simply produced from dried chilies, olive oil and garlic (recipe provided on p. 267), while other, formerly-exotic ingredients such as turmeric can now be procured at most larger grocery chains. A good place to dive in to this book is the section on street food: the ingredients are fewer, the preparation time short, and the results mouth-watering enough to draw in pedestrian traffic. Street food would also be ideal for a 20-something birthday dinner; what other demographic is more accustomed to high-quality and novel food sur la pouce while enroute to a late night gathering with similarly inclined friends? For this particular celebration, Chicken Kebabs with Spicy Avocado Dip (p. 70) fit the bill: organic chicken breasts (on this occasion from local Ontario producer, Yorkshire Valley Farms), were cubed and marinated in turmeric, cumin, paprika and ginger, while the avocados were mashed with garlic, cilantro, cumin, lemon juice and chilies. 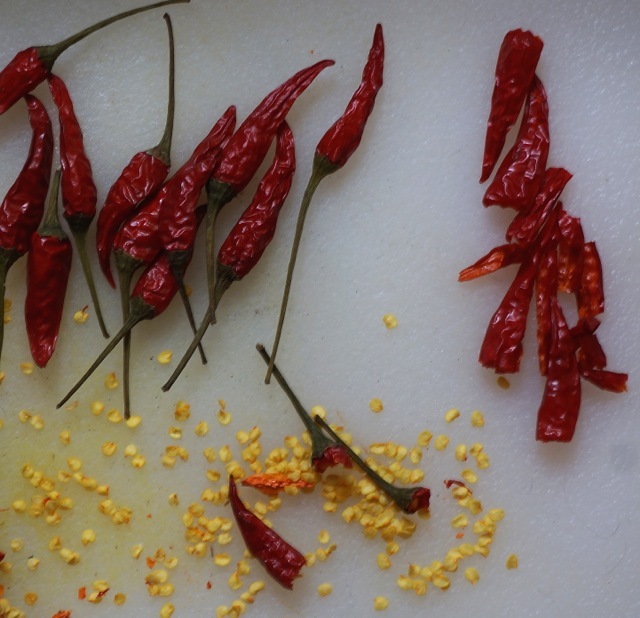 Harissa is simple to make at home using dried chillies. The skewered cubes were barbecued and served on Mediterranean flatbread smeared with the avocado dip and dressed with butter lettuce leaves. The result exceeded expectations, thanks to the clear and simple instructions and wonderful flavour and texture combinations. The warm bread and soft avocado and butter lettuce provided a subtle spotlight for the tender, juicy but substantially flavourful chicken. A tagine of potatoes, fennel and peas (p. 156) was served as a side dish and to nourish the vegetarians. Where this book meets its mark is in its respect for the culture of Marrakesh, and its simple and honest delivery of Moroccan food in context. The photographs are stunning, as one would expect from David Loftus; however, the quality of paper does not always do justice to the beautiful colour reproduction. And if using an actual tagine in any of the recipes calling for one (we did), the reader is left to guess temperature and cooking times. It certainly sounds authentic enough to me, but it might lead one to produce disappointing and over-cooked peas (it did). The verdict: anything that keeps my adult children coming home for the occasional dinner – even if only a pit-stop on the way to a club – is worthy of my attention. According to them, Chicken Kebabs with Avocado was the true Nirvana of the evening. 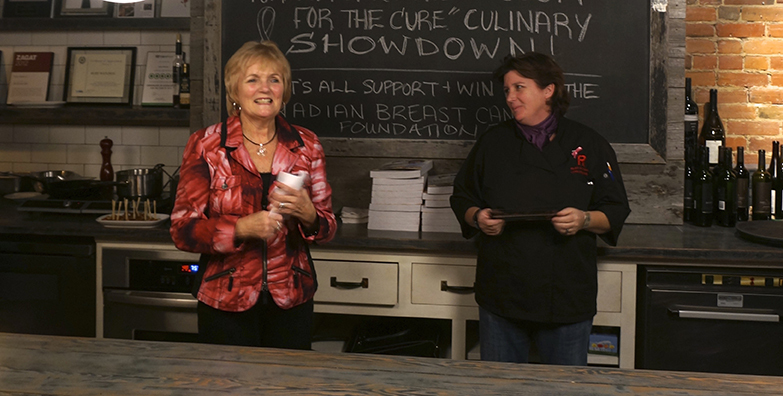 This year, the Canadian Breast Cancer Foundation will hold its “Cook for the Cure” Event on Dec. 7th, 2013, featuring top chefs Lynn Crawford, Tyler Florence, Chuck Hughes, Mark McEwan, Corbin Tomaszeski and Vikram Vij. The major sponsor is KitchenAid. To raise funds and friends for her team, Chef Lynn Crawford held a cocktail event this past Thursday at her Toronto restaurant, Ruby Watchco. She invited guest speaker, Bonnie Stanfield, whose daughter, Holly, lost her battle with breast cancer at age 34. Bonnie spoke bravely about how her life has been changed by the disease and by the work of CBCF to support research, patients and families. Lynn generously provided wine and beautiful hors d’oeuvres, including the devilled eggs with watercress, and chicken liver parfait with confit of beets, pictured here. I enjoyed a glass of excellent Meritage. I have put my support behind Chef Lynn: she is not only a great person but also the only female chef in the competition. You can support Team Crawford’s fundraising for the Canadian Breast Cancer Foundation, and learn more about Cook for the Cure, by visiting the official website here: Support Cook for the Cure.